Handrails are a part of our life. This is a simple hand rail that we built for our friend Bill to meet code. You might need something similar to meet a required building code or just for general safety purposes. This handrail, if constructed properly, will exceed OSHA and BOCA requirements. Before buying anything you need to do some measurements. 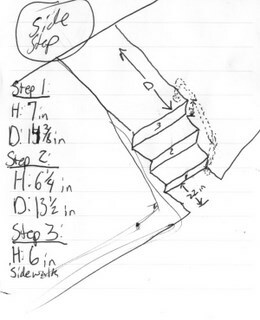 First we did a basic drawing of the area. This helps us keep our numbers straight. It doesn’t have to be anything fancy. Mark where you want the posts to go. This will serve as a reference point. Write all this information down on your drawing. When you finish you should have something like the picture below. Like this project? 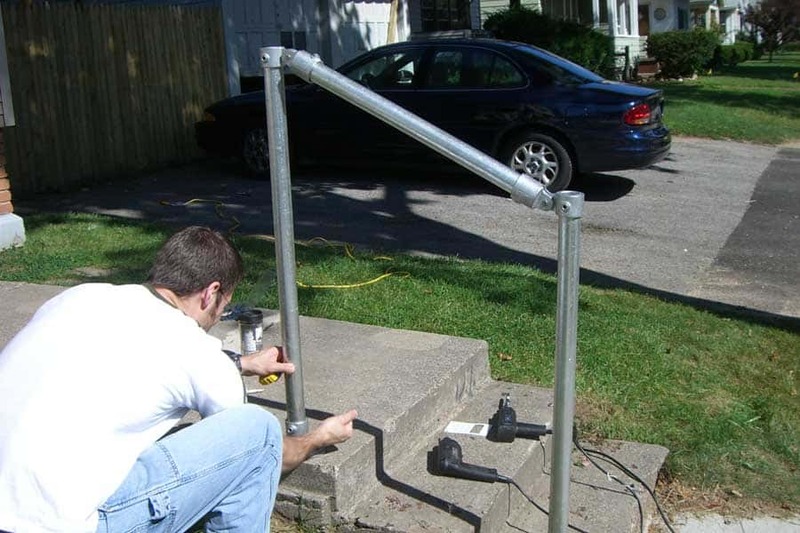 Now building a simple handrail is even easier! 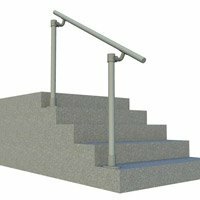 Constructed with Kee Klamp fittings, Simple Rail handrails are durable and easy to install. 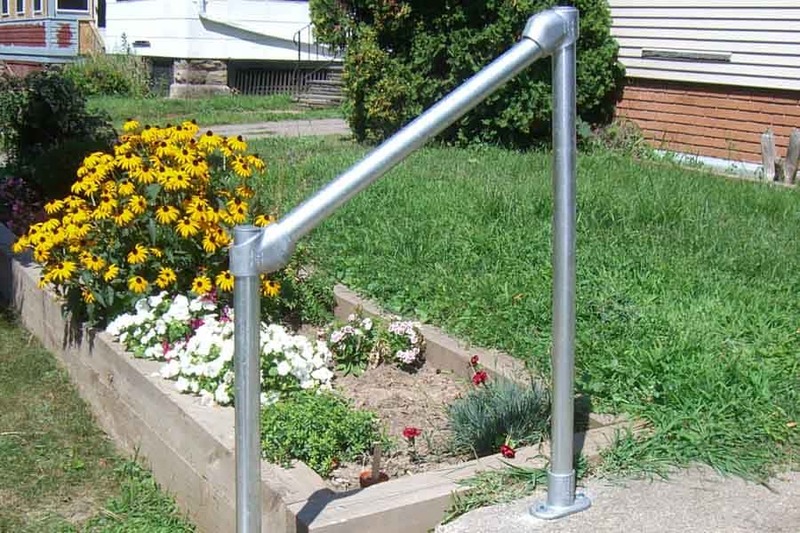 Simple Rail™ kits are great for home owners, business owners and landlords who need to provide code compliant railing. Now that we have our step dimensions we need to make some calculations to determine how much pipe and what type of fittings (we are using Kee Klamp fittings) we will need to complete this job. Calculating the length of the hand rail is a bit more complicated. To do that we take the distance from post to post. Add the step length plus the length from the post to the step. Then we determine the height of the steps. Add the step heights together. At this point, you will likely need a calculator. In order to get the angle with the height and the length use the following equation. Divide the Height by the Length. Then do an Inverse Tangent on that number. That number should be the bottom angle of your handrail. Now that you have the angle you can determine the type of fitting that you want to use. Kee Klamp fittings offer a number of angled fittings. For our project because of the angles we’re going to be using a Type-C50 fittings at the top and at the bottom. They allow you to create a handrail at just about any angle. First we determine the overall length using the classic formula you learned in geometry a2 + b2 = c2. We just square the height and the length. Add them together. And take the square root of that number. That will give us the overall length. Now we’re not done. Because the fittings have some length to them we need to to a little math. There’s a handy chart on page 33 of the Kee Klamp catalog (create free account to see PDFs of the catalogs) or you can find the references on our handrail page, which gives us the numbers we need to subtract. There is no figure for the C50 (they do have offsets for other popular fixed angle fittings) so we just figured an 1" on each side. There are many different types of flanges to mount your handrail. We chose to use a simple Type 62 flange. We then used Tapcon concrete anchors to secure these to cement. Because we are using a Type C50 fitting we’ll need a Type 84 malleable plug. This will finish off the top pipe and make sure no water gets inside. 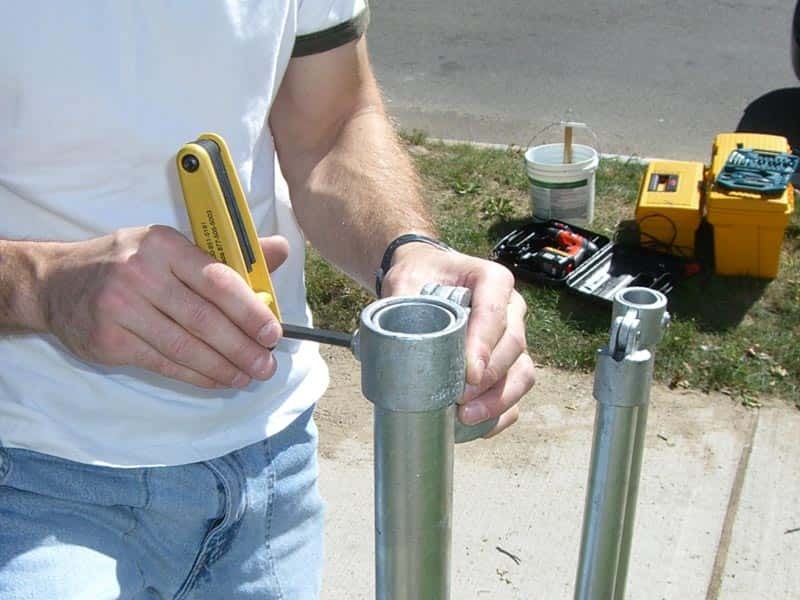 When installing a handrail make sure that you use Schedule 40 Pipe or Gator Tubing. When selecting pipe you want to make sure that the steel is galvanized. This will ensure that you handrail will not rust. You might also think about having your pipe powder coated to protect it. 62-8 - Standard Railing Flange, 1-1/2"
C50-88 - Single Swivel Socket, 1-1/2"
84-8 - Malleable Plug, 1-1/2"
Because we are not experts we built this from one end to the other. This is not the most efficient way to do it, but it will ensure that rail is firm and does not have any slop in it from mismeasurement. Place the flange so that you can see your mark in the middle of the circle. Mark the two hole locations with the marker. Building up from the bottom we now attached the post. After securing the post to base flange we connected the C50-88 and then we attached the handrail. We let the handrail hang down for the next step. At this point you can basically assemble the rest of the handrail (without the flange secured). This will give you the opportunity to line up the top base flange. Walk around the railing, make sure everything looks lined up. If everything looks good. Mark the holes for the top base flange and secure it to the ground. After securing the top base flange, then insert the top post. Attach the top C50 swivel fitting to the top post and then to the handrail. 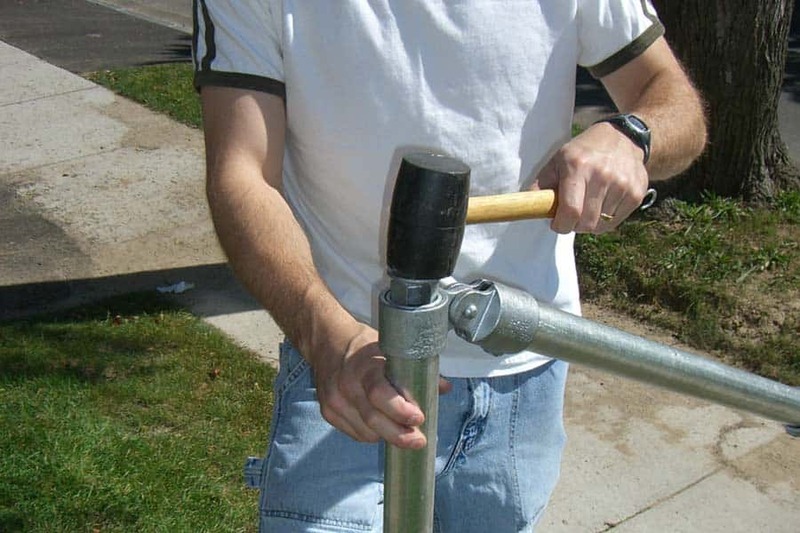 To keep water from getting into the pipe and to give the railing a finished look insert the plugs and pound them in with a mallet (or hammer with a cloth over the plug. Once these plugs have been pounded into place they will not come out easily. Step 7 - You're Done! Overall this is a really simple project. The savings is going to be the cost you save in having someone else install one of these things if you need to meet code.